If your Kindle hasn’t connected to the internet in the past 3-and-a-half years, you may want to get it online real quick today. Amazon is warning customers, in any way it can, that a vital update is required for Kindles that haven’t been online since Oct. 5, 2012. And one of those ways is by sending a postcard. Users who fail to download the update will be locked out of the Kindle Store and unable to download Kindle books in the cloud as Amazon changes its security. After today, users will have to download the update to a computer and manually install it to get those features. But Amazon isn’t just posting a help page to let users know about the change—it’s also sending out snail mail. According to MobileRead posts spotted by Nate Hoffelder at The Digital Reader, Amazon is sending out “carefully designed, high-dollar production” postcards. 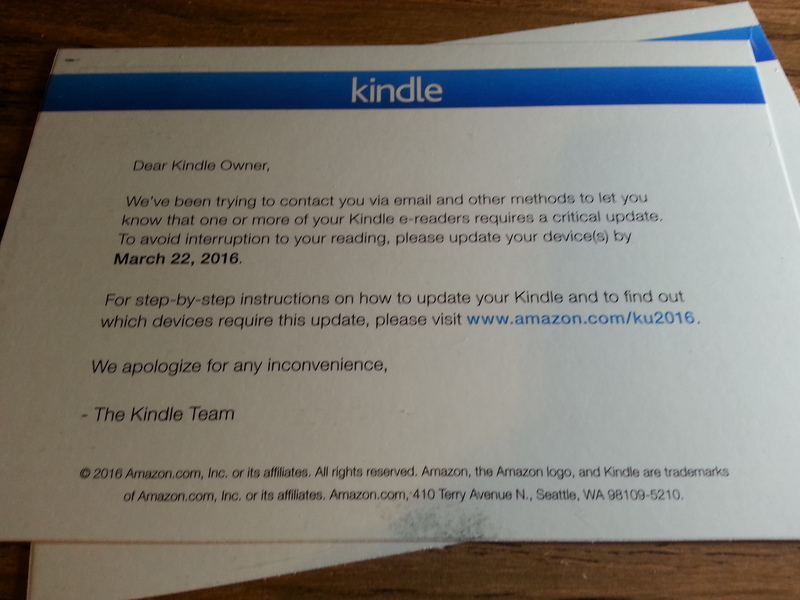 We’ve been trying to contact you via email and other methods to let you know that one or more of your Kindle e-readers requires a critical update. To avoid interruption to your reading, please update your device(s) by March 22, 2016. For step-by-step instructions on how to update your Kindle and to find out which devices require this update, please visit www.amazon.com/ku2016. The eBook Evangelist also got a postcard, which you can see over on their site. Hoffelder notes some of his readers haven’t had an easy time updating, even though they tried the update before today’s cutoff. However, that user still had issues after updating. Users can attempt to update by connecting to WiFi (or a cellular network for the oldest models) and selecting “Check for New Items” or “Sync and Check for Items” in the Kindle menu. Amazon suggests leaving your Kindle connected and plugged in overnight to finalize updates. Users who miss the update today can manually update their Kindles; they can start by finding their device on this page.